The Pequot Water Company was a soda and spring water bottling company where I grew up in Glastonbury, Connecticut. 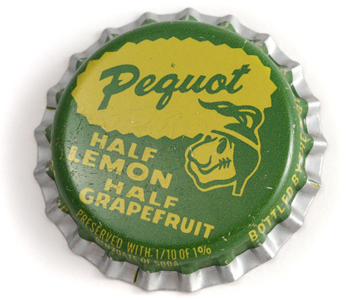 Pequot soda came in a long list of flavors, like orange, root beer, and lemon-lime. Trucks came directly to our door to deliver the specific flavors my mother had ordered. The glass bottles with a cork-lined cap were transported in heavy wooden crates, with 12 bottles per crate. When the soda bottles were empty, the truck returned to take the crate of empties back to the bottling plant to be reused. The Pequot Water Company was started in 1916 by the Roser family, of Glastonbury. The water used to make the soda was from an onsite spring that was purported to have magical powers by the local Indians. Pequot soda was delivered on trucks from the early 1960s into the 1970s. The company has since closed, and the building stands empty, having been recently sold. But the name of “Pequot soda” brings a smile to my face as I remember how great it tasted and how much by brothers and I enjoyed it as kids. Have any memories to share about Pequot soda? Share below.